20/1 shot Reserve Tank continued a fine week for trainer Colin Tizzard with an eye-catching success in the G1 Betway Mersey Novices' Hurdle. Ridden by Robbie Power, recording his third G1 success of the week at Aintree, the five-year-old son of Jeremy showed a smart turn of foot in the closing stages to repel the sustained challenge of the Olly Murphy-trained Brewin'upastorm (100/30) to score by three and a quarter-lengths. Two years ago jockey Robbie Power rode a Grade 1 three-timer at the Randox Health Aintree Grand National meeting, and the Irish jockey has repeated the feat again this year. Earlier this week he won on Lostintranslation (Betway Mildmay Novices' Hurdle) and Supasundae (Betway Aintree Hurdle) - this year's third victory came today on aboard the Colin Tizzard-trained Reserve Tank in the G1 Betway Mersey Novices' Hurdle. The son of Jeremy was sent off a 20/1 chance and won by three and a quarter lengths. Power has already ridden a Grand National winner, taking the race on the Gordon Elliott-trained Silver Birch in 2007. He has completed the race every year since 2015 finishing 13th on Owega Star in 2015, fourth on Gilgamboa in 2016, eighth in 2017 on Regal Encore and tenth on Raz de Maree last year. Power rides Jury Duty in today's Randox Health Grand National and said: "If he gets the trip he has a huge chance. You don't know how he'll take to these fences, but he is a very good jumper. This sun is helping his chances." Ballymore Novices' Hurdle fourth Brewin'upastorm is finished for the season and is likely to go chasing straight away next term after ending his campaign with another fine effort at the top level. Olly Murphy's six-year-old (100/30) momentarily threatened to overhaul 20/1 chance Reserve Tank on the run-in, but the Colin Tizzard-trained winner appeared to outstay him and beat him by three and a quarter lengths. 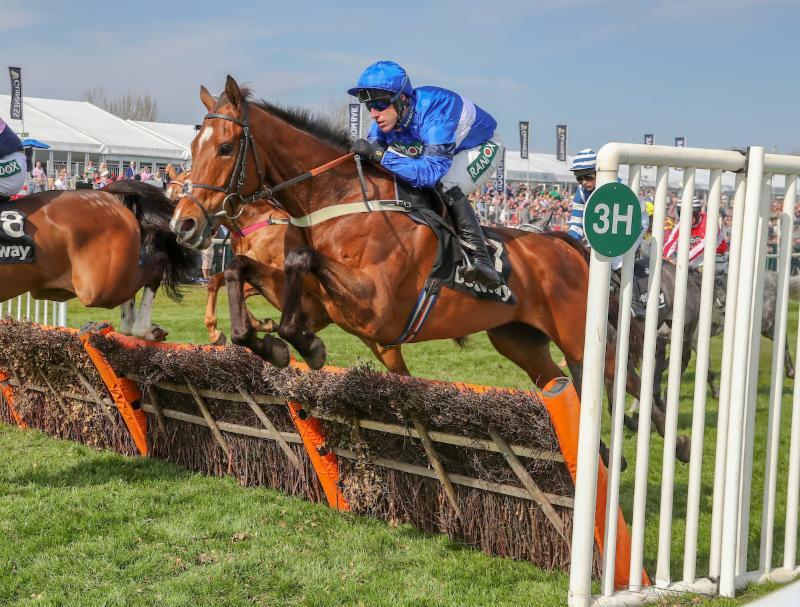 Murphy said: "He ran a cracker, We were second best on the day and there are no excuses, but he's going to be a gorgeous horse to go chasing with next season. I just thought he would pick up Colin's horse from the last, and I don't know if we've been outstayed again or whether it's just the end of a long year, but he did nothing wrong. "Of course you are a little disappointed he didn't win, but he's done us proud and has some big days to look forward to. One thing he won't be doing though is going any further than two and a half miles." There was a dead-heat for third place between Angels Breath (11/4f) and One For Rosie (5/1). Nigel Twiston-Davies, the trainer of One For Rosie, said: "I'm delighted - he's a really nice horse, the race wasn't run to suit him and he will go chasing next season. He keeps improving and he'll want three miles one day." Nicky Henderson, who trains Angel's Breath, said: "He was looking nice and relaxed, and then the pace slowed and he got horribly keen. He has to learn to race more sensibly - he's doing too much. He's an eternal enthusiast - like me! He went to the start with ear plugs in, and perhaps we have to run him in a hood. We have a few bits of kit we can try in the future. "He's a chaser for the future. He won't run again this season and we'll probably try novice chasing next season. He's a very good horse."